The VIP Collection will expand over the coming weeks and months and will feature a selection of some of the finest diamonds and jewellery we have been privileged to photograph throughout our career. In 1999 we photographed this fabulous diamond for the special Centurions Promotion for Tatler, Conde Nast. Timothy Rennie was the Art Director and we shot the stone in the inner sanctum of DTC (Diamond Trading Company) just down the from our studio. Without a doubt it was the most beautiful diamond we have ever seen. The diamond was uncovered in the early 1990s and began life as a huge 777-carat rough. It was designed and cut by Diacore over an intense three year period. The finished stone is a spectacular classic pear-shape, weighing 203.04 carats. The Millennium Star is one of the most magnificent diamonds of all time, to hold it is literally to hold history in your hand. The Millennium Star and The Midnight Collection of blue diamonds are known as 'The Millennium Collection' and they made their world debut in London in the millennial year, as the main exhibit in an exclusive exhibition held at the famous Millennium Dome. The Pink Star is regarded as the most magnificent and largest flawless, fancy vivid pink diamond in existence, it is without equal. This exceptional diamond was discovered in Botswana in 1999 as a huge 312.5-carat rough; it took 20 months to cut into the exquisite nearly 60-carat oval diamond it is today. The actual carat weight of The Pink Star is 59.60-carat. In 2017 The Pink Star went up for auction and was purchased by Chow Tai Fook, one of the most important diamantaires in the world and rechristened 'The Chow Tai Fook Pink Star'. We photographed The Pink Star in 2011. On the 24th September 2009, South Africa's historic Cullinan mine once again hit the headlines when an extraordinary rough diamond weighing 507-carats was recovered. This spectacular stone was named The Cullinan Heritage to honour the location which has produced some of the world's most famous and important diamonds. The stone went on to be auctioned in 2010 and the winning bidder was Chow Tai Fook. From this exceptional rough came 24 exquisite cut and polished stones. Included in this collection is the fabulous Cullinan Heritage Diamond, which when finally finished in 2014 weighed 104-carat and still holds the record for the largest and most flawless brilliant cut diamond in the world. We shot this magnificent stone in 2011 and again 2014. It is difficult to emphasize enough just how important and exceptionally rare a stone such as this is. This fabulous necklace was designed and created by Chow Tai Fook. It features more than 43 carats of the famous Argyle Pink Diamonds, including five Argyle pinks from the special Argyle Pink Diamond Tender, which took over five years to collect. 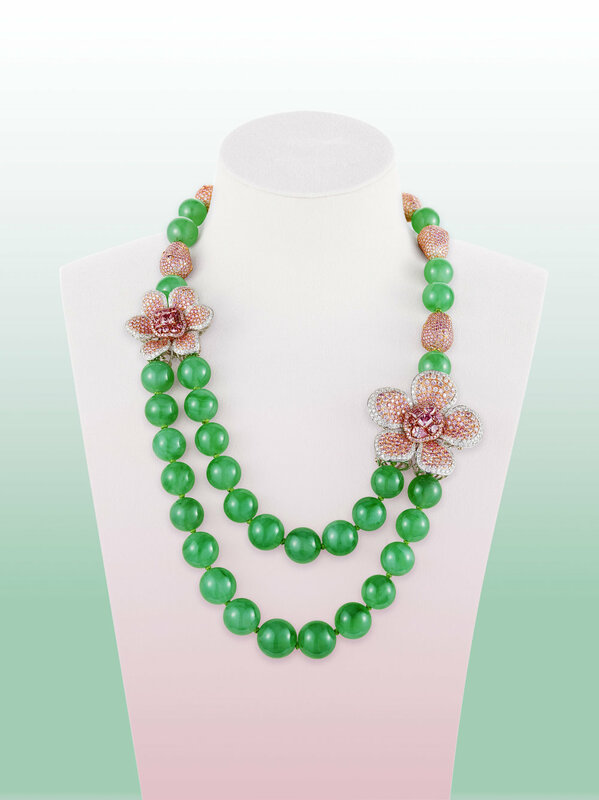 The diamonds are surrounded by thirty five Imperial Jadeite beads. We photographed the necklace in 2014 at the headquarters of Chow Tai Fook, in Hong Kong.